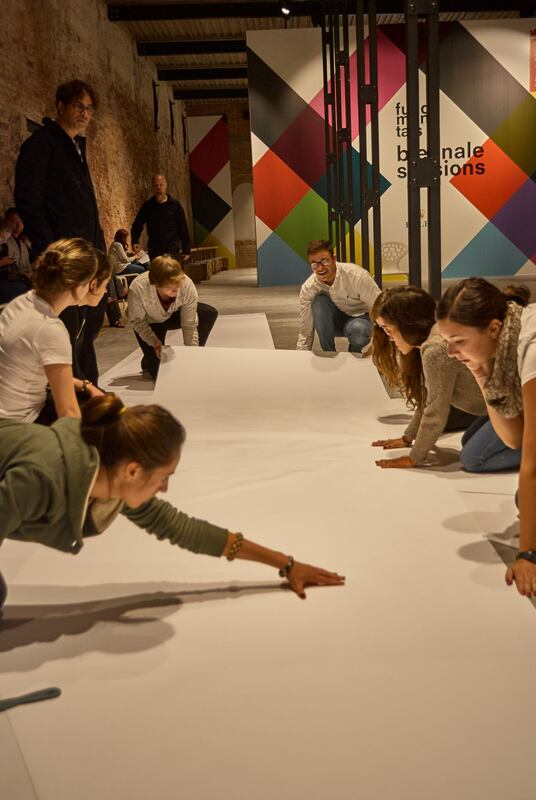 In 2014 Iowa State University’s College of Design Department of Architecture was invited for the first time to prepare a session for the Venice Biennale. 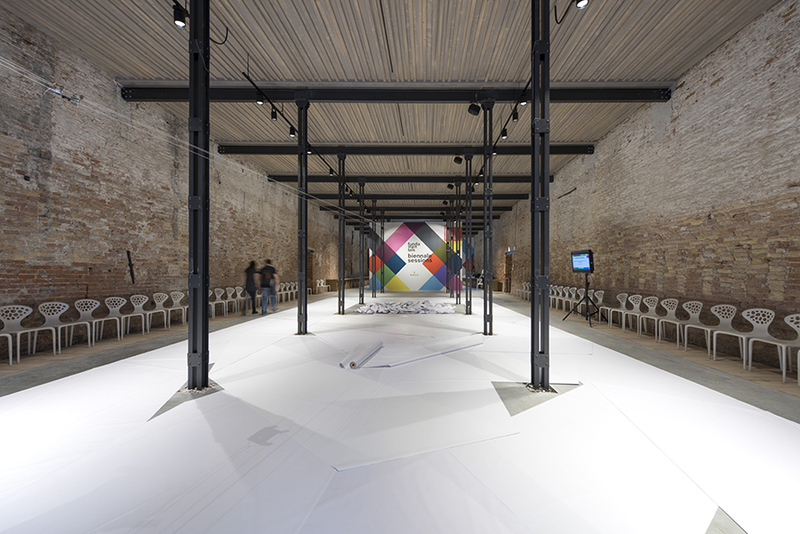 “Fundamentals” was the celebrated theme of the 2014 Venice Biennale of Architecture, curated by Rem Koolhaas of the Office of Metropolitan Architecture (OMA). The workshop was organized by Cameron Campbell, Peter Goché and Mitchell Squire. Of the ‘elements’ of architecture, the ISU Department of Architecture’s workshop focused on the fundamental ‘floor’ – architecture’s topographic surface — as something more than a flattened space on a denatured field. The theme was divided into three exhibitions: Absorbing Modernity 1914-2014, Elements of Architecture and Monditalia. The first – the issue each national pavilion was asked to address – is intended to provide historical research in order to explore how Modernity and globalization has, since 1914, formed the architecture we practice today. The second is intended to pay close attention to the fundamental elements of architecture – the floor, the wall, the ceiling, the roof, the door, the window, the façade, the balcony, the corridor, the fireplace, the toilet, the stair, the escalator, the elevator, the ramp, et cetera. The third provides an intensive focus on Italian design, understanding Italy as possessing one of the most prolific design cultures today. Floor is the primordial element on which spatial productions are founded and the site of deliberate and spontaneous transformation. To “take the floor” or to “be floored” are everyday idioms that hint at an underlying structure of what is for many a familiar surface from which to rise or, perhaps ingloriously, fall. We find a similar consequence with the specific topography of the Venetian Lagoon and there by directly link the intellectual evidence of a stable set of fundamentals to the visual evidence of an unstable aquatic ground plane. 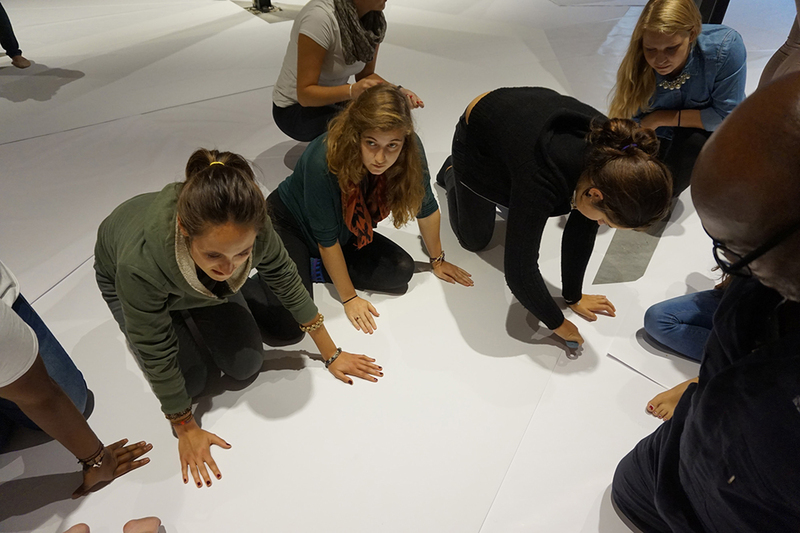 This relationship formed the basis for the workshop as participants sought to stage an intense but delicate floor formation in an antiquated arsenal. Like most land-use practices, this effort to rethink the floor of the Arsenale was intrinsically grounded in the spatial and cognitive confines of its surroundings, not the least of which was a great deal of paper. Richard Sennet’s “Together: The Rituals, Pleasures and Politics of Cooperation,” underpins the otherwise delicate paper that was the chief component utilized in this creative workshop. While most architects gravitate toward Sennet’s earlier work, “The Craftsman,” a deeper analysis exists in this recent text that argues cooperation is a craft. The intersection of craft and cooperation may well be the new fundamental that necessitates an extension of the architect’s focus beyond material mastery. The workshop was divided into morning and afternoon sessions, which were then linked to the following colloquium by the screening of a video documentary of the project’s evolution in an attempt to capture the cooperative spirit between cast members.